There are two methods of releasing sterile fruit flies – ground releases and aerial releases. At present on ground releases are carried out. Ground releases are specifically aimed at home gardens and backyards (in towns and on farms) and other fruit fly hotspots in the target area. These are the breeding grounds of fruit flies – the great majority of fruit flies occur and breed in these areas until the commercial fruit crops ripen and become attractive to fruit flies, when they will start migrating to these crops. The objective of ground releases is to suppress fruit fly populations in their breeding grounds early in the season before the commercial fruit ripens. If the garden sanitation and host plant management is correctly carried out, the sterile males will ensure that there are virtually no wild flies which can migrate to commercial plantings during the fruit season. 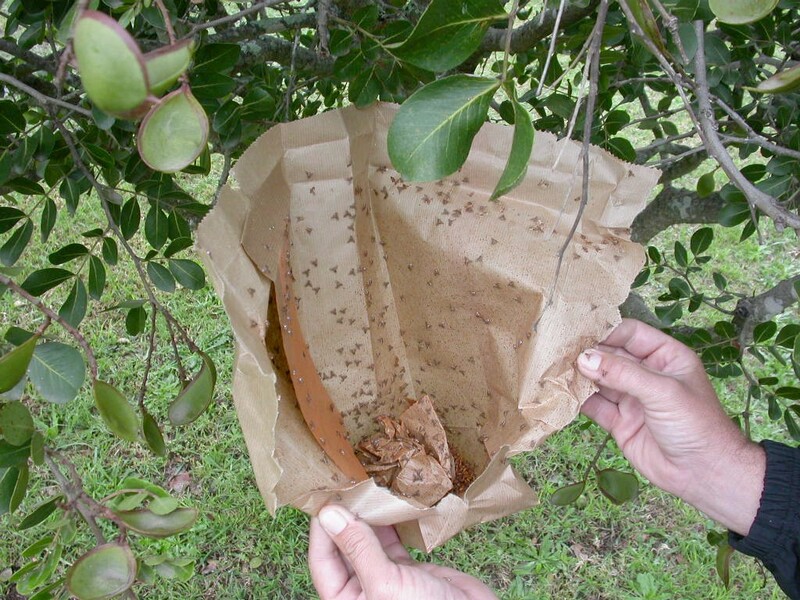 Fruit Fly Africa supplies sexually mature sterile Medflies in paper bags, which are then distributed to the release areas where they are placed in farm and urban gardens. Between about 5,000 and 40,000 sterile flies are released per site per week, depending on the size and the time of the year. Aerial releases, at a density of 500 to 1,000 sterile flies/ha, are generally more effective than ground releases as they cover an entire target area, but unless the area is large (e.g. 50 000 ha or more), they are not cost-effective due to the high cost of the release plane. As the fruit fly SIT programme expands and more production areas join the SIT programme, aerial releases, which cover the entire target area, will again be considered (see below).